Traverse across the Onslow Glacier to gain the broad rib on the right side of the Face. Head up the rib, which eventually merges into the 45-50 degree slopes of the upper face, arriving on the summit ridge between the East and High Peaks. An enjoyable climb with plenty of variety. Access from Onslow Hut is easy except for a short section of rotten rock. The lower flat sections of the ridge can be avoided by keeping to the Onslow Glacier, but two prominent rock steps have to be climbed where the ridge begins to steepen, and after another 200m a snow bulge is climbed. The route then gradually lies back up to the East Peak. It is roughly 25 minutes from here to the Main Peak. Ascend from Malte Brun pass onto this ridge climbing good rock over the East Peak and on to the high peak. The ridge starts in the Cascade Glacier but is gained at half height from Malte Brun Pass. Via the Malte Brun Pass. 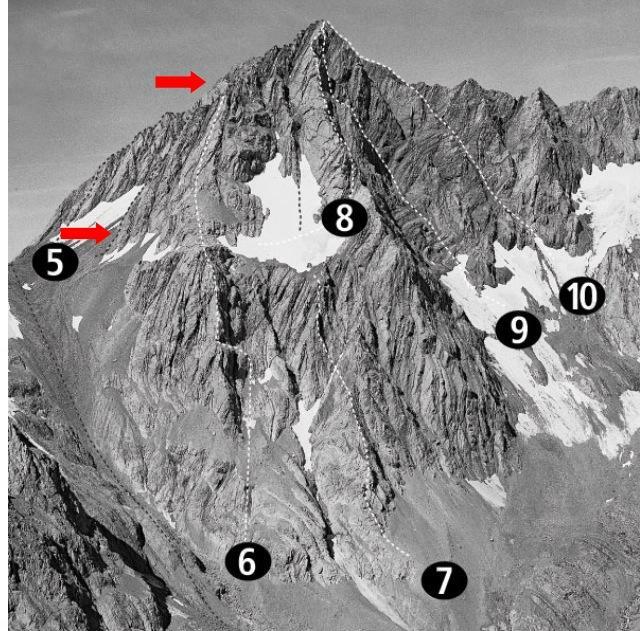 There are two narrowish couloirs, the left one leading up to near the East Peak, and the right one providing access to broad snowslopes leading to the main summit. A good descent route. Freda Du Faur, Peter Graham, Mar 1913. From the Pass ascend the ridge to the right of the NE Ridge. Excellent rock. Farther right are steeper variations with good climbing. Starting right of the North West Ridge, from the upper Beetham Stream, climb up a ridge crossing the occasional shingle covered ledge. Continue up the snow slope to link with the small ridge between the North West Ridge and the West Ridge. Joins the North East Ridge below the summit. Climb the gully between the two rock buttresses on the west face. Left of the West Ridge. Climbed with snow/ice in the gully. From Malte Brun Pass traverse across scree ledges to gain the ridge at half height. Ascend good rock with some surprisingly difficult sections. Approached from the upper Beetham Valley. 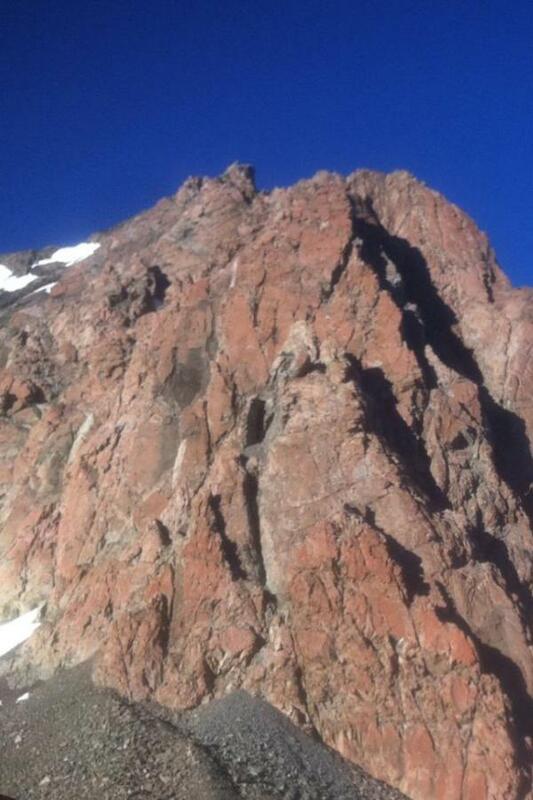 Ascend the prominent couloir on the south-west face. Approached from the upper Beetham Valley. 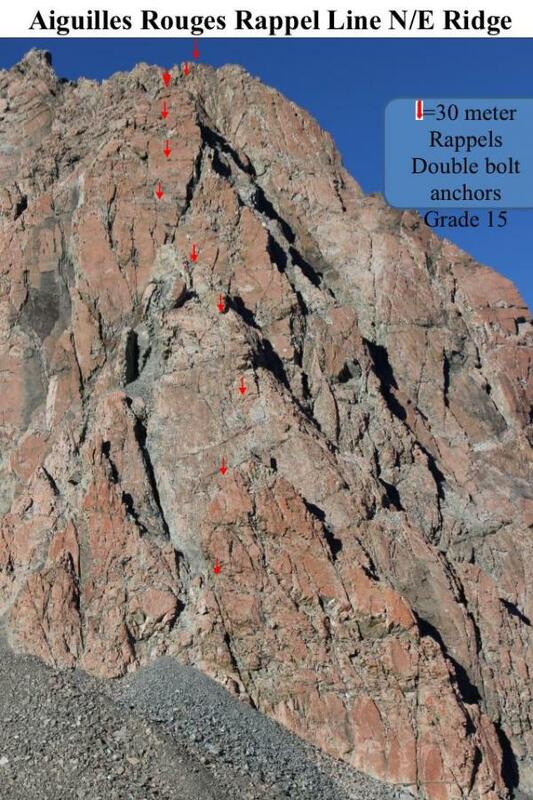 Gained by a large winding couloir (prone to rockfall), which ends in a short rotten rock face. The ridge is rather rotten at first and then improves. Facebook NZAC, Will Rowntree, Rapline.